Reciprocating Air Compressor has also classified according to its stages. So, Classification will help you better understand the working of the reciprocating air compressor. The principle of operation is same in each type. But according to stages, the building of discharge pressure is different in each compressor. The reciprocating type compressor consists of a piston which is enclosed within the cylinder & equipped with suction & discharge valves. 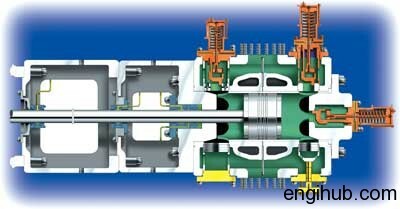 The piston receives power from the main shaft through the crankshaft and connecting rod. A flywheel/belt wheel is fitted on the crankshaft which is driven by electric motor or diesel engine. It supplies uniform motion throughout the cycle of operations. The compression of air is done by first drawing a volume of air into its cylinder through suction valves during suction stroke by the piston & then compressing & discharging it on the return stroke of the piston through delivery valves. This simple working is used in every Reciprocating Air Compressor. You will easily understand compressor engineering from below description. In single stage reciprocating air compressor, the entire compression is carried out in a single cylinder. If the compression is affected in one end of the piston & cylinder then it is known as single acting & if the compression is affected in both ends of piston & cylinder then it is known as a double acting reciprocating air compressor. The opening & closing of a simple check valve (plate or spring valve) depends upon the difference in pressure, if mechanically operated valves are used for suction & discharge then their functioning is controlled by cams. The weight of air in the cylinder will be zero when the piston is at top dead centre. At this position, you have to neglect clearance volume. When piston starts moving downwards, the pressure inside the cylinder falls below atmospheric pressure& suction valve/inlet valve opens. The air is drawn into the cylinder through a suction filter element. This operation is known as suction stroke. When the piston moves upwards, compresses the air in cylinder & inlet valve closes when the pressure reaches atmospheric pressure. Further compression follows as the piston moves towards the top of its stroke. Until when the pressure in the cylinder exceeds that in the receiver. This is compression stroke of a compressor. At the end of this stroke discharge/delivery valve opens & air is delivered to a receiver. When it is a double acting reciprocating air compressor, suction stroke is in process at one end of the piston. While at same time discharge stroke is in process at another end of the piston. In simple word, we can say that suction & compression took place on both ends of piston & cylinder in double acting reciprocating air compressor. Double stage or two stage reciprocating air compressors consists of two cylinders. One is called low-pressure cylinder and another is called high-pressure cylinder. When piston in a low-pressure cylinder is at its outer dead centre (ODC) the weight of air inside a cylinder is zero (neglecting clearance volume), as piston moves towards inner dead centre (IDC) pressure falls below atmospheric pressure & suction valves open due to a pressure difference. The fresh air is drawn into the low-pressure cylinder through air suction filter. This air is further compressed by piston and pressure inside & outside the cylinder is equal, at this point suction valves closed. As the piston moves towards ODC compression of air took place and when the pressure of air is in a range of 1.5 kg/cm² to 2.5 kg/cm² delivery valves opens & this compressed air is then entered into a high-pressure cylinder through the intercooler. This called low-pressure compression. If suction & discharge stroke took place on both sides of the piston then it is called Double Acting Low-pressure compression. Suction valves of a high-pressure cylinder open when the air pressure in a high-pressure side is below to the receiver pressure & air from low-pressure cylinder drawn into the high-pressure cylinder. As piston moves towards the ODC, first stage air is further compressed. When air pressure from the low-pressure cylinder and inside the high-pressure cylinder is equal, suction valves closed. Now the air is further compressed by piston until the pressure in the High-Pressure Cylinder exceeds that of the receiver & discharge valves open. This desired high-pressure air is then delivered to a receiver. The Same procedure is repeated in every cycle of operation. If suction & discharge stroke took place on both sides of the piston then it is called double-acting high-pressure compression. In double stage, reciprocating air compressor air pressure can be developed in a range of 5.5 kg/cm² to 35 kg/cm². Normally where we required air pressure above 7.0 kg/cm² & delivery of air above 100 cubic feet/min. this double stage reciprocating air compressor is used. This is the most common model used in various engineering plants. If we required air pressure above 35 kg/cm², this double stage reciprocating air compressor is not useful. There you have to use three-stage air compressors. Some industries required air pressure more than 35 kg/cm² to produce their product. For example, mineral water bottle (pet blowing) requires air pressure more than 40 kg/cm². To produce the desired shape of a bottle at the bottom side. Here Two Stage Reciprocating Air Compressor is not useful; we required the air compressor, who generates air pressure above 35 kg/cm². This discharge air pressure is achieved by a multi-stage air compressor. We normally use three stage reciprocating air compressors as a multi-stage air compressor. If we required discharge air pressure above 85 kg/cm² then four-stage air compressors are useful. The working principle of multistage air compressor is same as double stage air compressor. In three stage air compressor, fresh air from the atmosphere enters in a first stage (low pressure) cylinder. Air enters through a suction filter. This air is compressed by piston up to 4 kg/cm² & then delivered to the second stage (middle pressure) cylinder through intercooler for further compression. In this stage suction and compression took place on both sides of the piston. In the second stage cylinder low-pressure air is compressed up to 14 kg/cm² & discharge to the third stage (high pressure) cylinder through the second intercooler to achieve air pressure up to desired delivery pressure. During this stage suction and compression took place on one side of the piston. At high-pressure cylinder, the 14 kg/cm² air pressure is increased up to desired discharge range. It is from 35 kg/cm² to 85 kg/cm² by the piston reciprocating inside the high-pressure cylinder. In this stage suction and compression took place on both sides of the piston. The multistage reciprocating air compressor is used in few industries like Pet Blowing, CNG (Compressed Natural Gas) Center etc. All these high-pressure compressors are manufactured in India by Chicago Pneumatics, Ingersoll Rand, and Atlas Copco.